When I posted about the Little Bit of Ribbon hat I mentioned that it was my ‘easy’ entry for the HSF ‘Embellish‘ challenge, and that I was planning a much more elaborate embellishment. 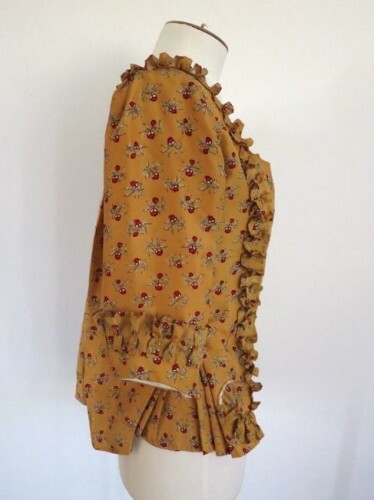 The more elaborate embellishment was ruffles for my pet-en-l’aire. 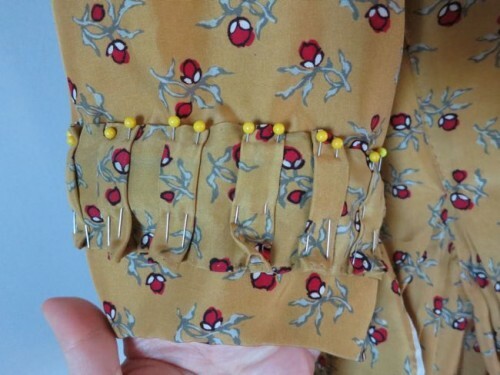 Now, this sound pretty easy – just pleat up the fabric and sew it on, right? Except that first I had to cut the last teeny tiny pieces of my silk that were left over from making the pet into strips, and sew them together, and then I had to hand-hem all the edges of that silk with teeny-tiny rolled hems (yes, thanks to the extensive discussion we had on pet trim, I know a full rolled hem isn’t historical, but it was a necessity with this fabric). And remember how tricky that fabric was to work with in the first place? Yeah, it hasn’t gotten any easier with time. Plus, it takes a lot of metreage to pleat up into a fairly small amount of ruffle. How much? Well, I did 8.8 metres of hand hemming on the ruffles that go around the neckline, and another 3.2 on the ruffles to go around the cuffs, for a total of 12 metres of hemming. In amongst all this I spent a great deal of time squinting at images of extent trimmed pets and other garments of the period, trying to figure out exactly how the trim was arranged and if the flatness was original, or a product of time and squashing. 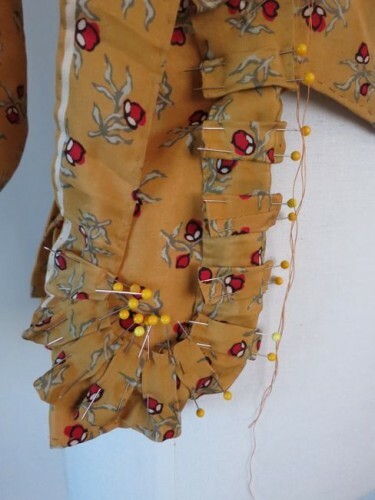 In the end, I balanced period examples with what looked right on my fabric, and my pet, when I sewed it together. 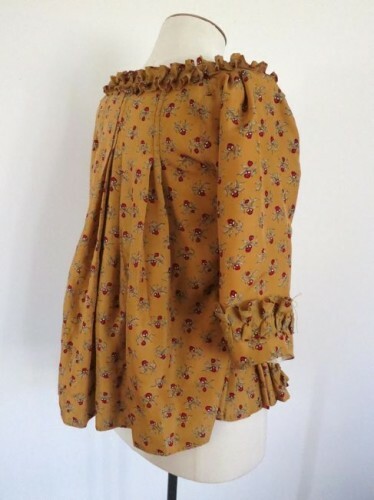 I ended up with slightly fuller gathered and ruffled pleats. They are the same pleating as in the photo two up, just pinched in the middle, and released on the edges. 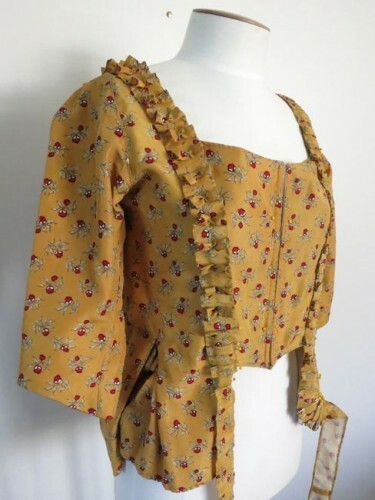 I think the dimensionality works well with the fabric, and with a bit of pressing, or sewing later on, I could achieve a flatter look more like the extent examples. 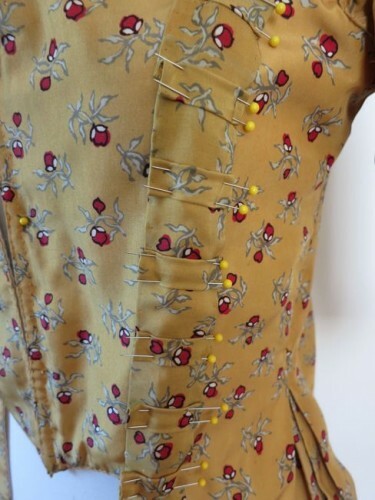 Now that I had placed my pleats much closer together I no longer had enough trim to go all the way around the hem of my pet, which I wasn’t actually sad about as I wasn’t sure I’d like the effect, and thought it might interfere with the pleats at side and back. Instead, I curved the pleats up into a circle or rosette at the hem, inspired by the MCG example with its curved trim. I pinned it on, sewed most of it on, and tried it on. It looks dreadful. Ridiculous. Sure it isn’t sewn all the way, but the placement is still wrong. Make white silk sleeve cuffs, as per these examples from the Met. I’m frustrated that it still isn’t done, but pleased that there has been some progress, and that it is more embellished than it used to be. I do like the silk cuffs from the Met. I’m not 100% sure whether I think they’d work with your pet, but there’s only one way to find out. 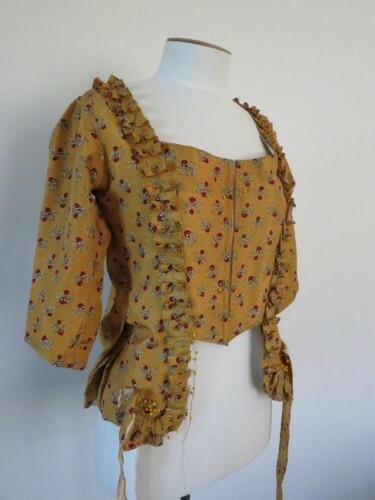 I think it would look good with no sleeve trim, since the sleeves are shapely anyway and attention would then be drawn to the awesome pleated rosettes. It might add a little more interest to the cuff and might make the sleeve trim look less out of place (though I honestly don’t think it looks that bad). I do love the trim around the front with the rosettes! That’s a great idea! I vote this! You might take a look at the fashion plates Cassidy is putting on A Most Beguiling Accomplishment at http://mimic-of-modes.blogspot.com/. There are hosts of sleeve treatments. I suppose you’re out of trim? If not, hd you considered doubling the trim with a space in between the rows, such that there was one row close to the edge and one row perhaps two inches up the arm? I would definitely go for option number two. I think it will look very pretty. I like the white cuffs. They keep the sleeves clean – easier to wash cuffs than the whole garment! – and they feel right to me. And I hope lace is going to be involved at some point… just a light dusting of snowy lace. Thanks for the input. No lace – it wouldn’t be accurate for a pet of this period. 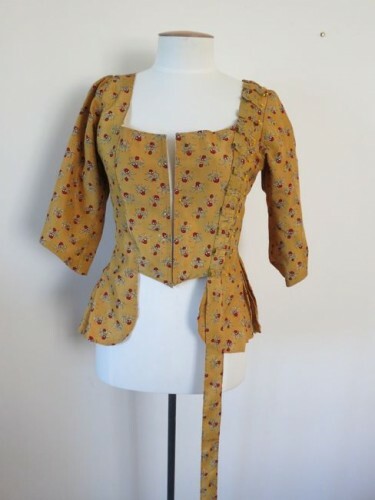 It will be worn with a neckerchief and accessories, etc, but no lace. metmuseum.orgAnd I like this little zoop of vertical ruffles going up the sleeve, too! 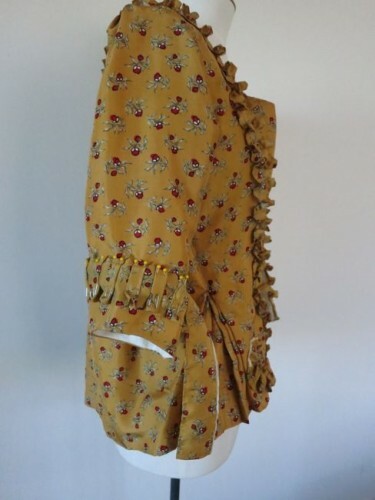 I don’t think the ruffles look silly, they look like false cuffs, Which I like. If I must give my opinion on which of the other options would be best then I choose #3, they would go very well with all the other bits of white fabric that appear in such an outfit. The ruffles down the front are a great improvement, not that the pet wasn’t already adorable, but the pleated trim makes it even better! Well, the best way to know is to audition the 3 different variations. 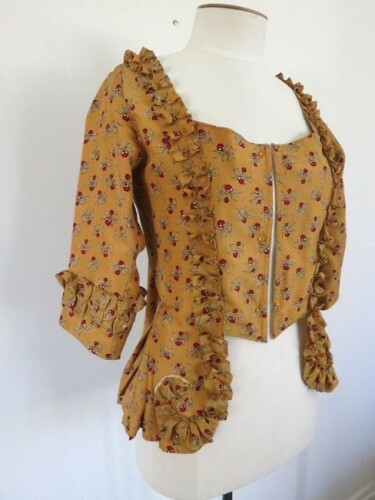 Also they more was more back then so they might love this…but this needs to be tailored to your aesthetic so there are many historical possibilities…even leaving the sleeve alone. There is so much loveliness going on…the small print, the short “skirts,” the trim on the front…that adding more trim to the sleeve is keeping the eye enormously busy taking it all in…whereas in a gown it might be more spread out. Perhaps if this pet were a solid color, you’d be loving all that trim more. It’s a lovely pet! Aww, I like the sleeve trim as is! Oh, I didn’t mean those particular examples (they are rather dreadful, aren’t they?). Just the idea of white silk cuffs. Not the white cuffs! They could be a whipped-on, washable trim/cuff/ruffle when you wear the pet. The silk you have used is to beautiful and rich and perfect – don’t dilute it. My vote is firmly for option two. 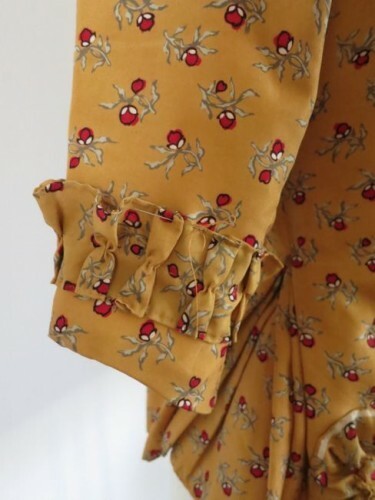 I was holding my breath as the post progressed, thinking you weren’t going to have enough for sleeve ruffles! It is looking just beautiful! I vote with Lynne. Beautiful project! 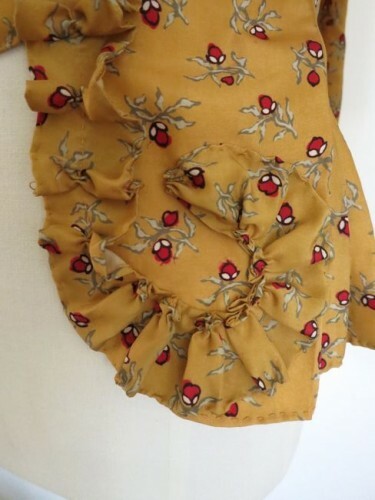 Pretty ruffles! 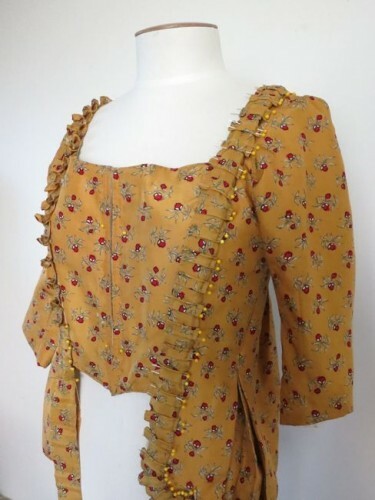 For a moment I’d forgotten about the pet en l’air and thought you were considering ruffles for Felicity. Ha!